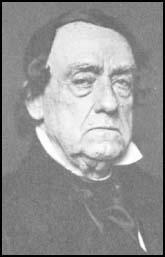 Lewis Cass, was born in Exeter, New Hampshire, on 9th October, 1782. He joined the United States Army and during the 1812 rose to the rank of brigadier general. He served as governor of Michigan Territory (1813-1831) and secretary of war (1831-36). A member of the Democratic Party, Cass was a elected to the Senate in 1845. He was a strong supporter of President James Polk and when he decided not to stand in 1848, Cass became the party's presidential candidate. However, he was defeated by Zachary Taylor of the Whig Party. Cass, who returned to office when he was appointed secretary of state (1857-60), died in Detroit, Michigan, on 17th June, 1866.